No. 1 Lions kick off 2018 on national TV in Chennault Cup game vs. Texas A&M-Kingsville. COMMERCE – The No. 1 Texas A&M University-Commerce football team kicks off the 2018 season in front of a national television audience, hosting Texas A&M University-Kingsville in the annual battle for the Chennault Cup in the NCAA Division II Showcase. RECORDS: This is the first game of the season for both teams. RANKINGS: Texas A&M-Commerce is ranked No. 1 in the AFCA Coaches’ Poll and No. 2 in the D2Football.com Media Poll. Texas A&M-Kingsville is unranked. • The Lions had previously won a national championship in 1972, taking the NAIA National Championship. • The Lions are the first team in the Lone Star Conference to win a Division II Football National Championship since 1983 and the only current team in the LSC to hoist the trophy. • The 2017 senior class established the school record for wins in a four-year period with the victory in the National Championship Game with 42 games won in a four-year span. • The 2018 seniors are already in the top five groups in school history at 33-7 with a guarantee of 11 games in the season. 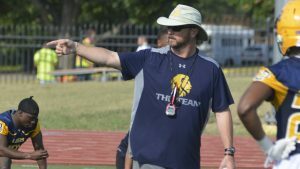 • Head coach Colby Carthel now ranks fifth in A&M-Commerce history in coaching wins with 49 wins. • However, he will be in fifth for a while, as his 49 wins are just over half of J.V. Sikes’ 63 wins in fourth place. • Bolstered by two games of over 10,000 attendance – including the National Semifinal win over Harding – the Lions’ attendance achieved new heights in 2017. • In only six home dates, A&M-Commerce drew a school record 51,482 total fans. That total attendance ranked third in Division II. • In terms of average attendance, the Lion faithful turned out at a rate of 8,580 per game. That ranked fifth nationally. • Over the last four years (available in the NCAA rankings database), the Lions have nearly doubled their average turnout since the 2013 season. The next closest season since 2009 was over 2,400 fans per game fewer. • The Lions were exceptional in the kicking and coverage phases, ranking highly in the nation in all punt and kickoff categories. • Lion offensive coordinator and assistant head coach Matt Storm won FootballScoop Division II Coordinator of the Year presented by AstroTurf following the championship season. • A&M-Commerce started the season with an 8-7 win over North Alabama. The Lions’ offense took off from there — all the way to the school’s first Division II National Championship. • The Lions topped the 30-point barrier in 13 of their remaining 14 games and busted the 50-point barrier four times. • A&M-Commerce also posted scores on 87 percent of its 69 red zone trips, including 41 touchdowns. • As a team, A&M-Commerce averaged 447.3 yards per game and 6.46 per play — both good for the top 30 nationally. • In April, former Central Washington defensive coordinator Scott Power joined the Lion staff as defensive coordinator. • In two seasons with Central Washington, Power turned the Wildcats’ defense around. After ranking near the bottom of the NCAA in scoring defense prior to his arrival in Ellensburg, the Wildcats ranked 19th nationally in that category in 2017. CWU ranked in the top 10 in the nation in rushing defense (first), sacks(first), total defense (third), third down defense (third), tackles for loss (fourth), and red zone defense (eighth). CWU was the national leader in rushing defense and sacks. • Entering his senior season, kicker Kristov Martinez is on pace to challenge LSC & NCAA records after one of the top seasons in program history. • Martinez made 24-of-28 field goal attempts in the 2017 season, tying the LSC record for most field goals in a season and becoming just the sixth Division II player to have 24 field goals in a season. • He is now 54-of-71 on field goal attempts in his career, which ranks 14th in Division II history. The Division II career record is 82 made field goals. • Martinez is the Division II active career leader in made field goals, and ranks third in all NCAA divisions behind Wisconsin’s Rafael Gaglianone (60) and Toledo’s Jameson Vest (57). Those three kickers are the only NCAA players entering 2018 with more than 50 field goals to their credit. • In the five playoff games, Martinez connected on 11-of-12 field goal attempts, including the last 11 in succession. He made a pair of 38-yard field goals in the two overtimes at Central Washington to seal the victory in the regional semifinal. • He connected on a career-long 48-yard field goal to break a tie in the fourth quarter of the regional final at Minnesota State and give the Lions the lead for good. • Martinez also connected on 65-of-66 PAT attempts, and has made his last 52 in succession. His only missed PAT attempt was deflected in the Eastern New Mexico game. • For his career, Martinez has made 176-of-183 PAT attempts and is the Division II active career leader. Oklahoma’s Austin Seibert is the all divisions active career leader with 223 made PATs. Martinez is fourth in all divisions behind Seibert, North Dakota State’s Cam Pederson (181), and East Texas Baptist’s Ryan Travis (177). • Martinez also excelled in the kickoff game, averaging 54.9 yards per kickoff with 44 touchbacks on 101 kickoffs. • The Lions led the nation in kickoff return defense, as their opponents averaged only 11.67 yards per return. Martinez’ 44 touchbacks tied the team for the second-most in the nation with Minnesota State behind Indianapolis (47). 1. 338 Kristov Martinez (176 PAT, 54 FG) 2015-pres. 1. 176 Kristov Martinez (176-183) 2015-pres. 1. 54 Kristov Martinez (54-71) 2015-pres. Martinez was named second-team all-Super Region Four by the Division II Conference Commissioner’s Association and Don Hansen’s Football Gazette. • He has been named a second-team preseason All-American by Lindy’s. • Martinez was also named LSC All-Academic and A&M-Commerce’s male LSC Scholar-Athlete for 2017-18. • The Lions’ leading tackler in senior Brucks Saathoff returns to lead the A&M-Commerce defense. • The San Antonio native has led the Lions in tackles for the last two seasons. • In 2017, Saathoff was the Lion leader with 101 tackles, averaging 6.7 stops per game. • For his career, Saathoff has 209 tackles, which is the leading mark for the Lions. • His 12.5 career tackles for loss is the second-leading returning mark on the squad. • Saathoff and safety Chris Smith are the only two returning defensive players to have played in all 39 games in the last three seasons. • Saathoff was a first-team All-Lone Star Conference selection at linebacker in 2017 after earning honorable mention All-LSC in 2016. • Don Hansen’s Football Gazette honored Saathoff with second team all-region honors and honorable mention All-America. • Saathoff was also one of 30 Division II finalists for the Cliff Harris Award, which is presented to the top defensive player in the country representing Division II, III and NAIA colleges and universities. • Saathoff had double-digit tackles in four games during the National Championship season, led by a season-best 14 tackles in the National Semifinal win over Harding. He also forced a fumble in that game. • Saathoff made 42 tackles in the five playoff games for an average of more than eight stops per game in that crucial stretch. • One of the Lions’ top defensive performers was also one of the nation’s top academic performers in 2017. • Redshirt junior Garrett Blubaugh returns as the Lions’ second-leading tackler. Blubaugh made 84 stops in the National Championship season and excelled in the playoffs. • He made 43 postseason tackles with double-digit tackles in the regional final and the National Semifinal wins. He had a career-high 15 tackles at Minnesota State and followed that up with 10 stops against Harding. He also had an interception in the comeback win over Central Washington in the regional semifinal. • Blubaugh was the football winner of the NCAA Elite 90 Award, which recognizes the top grade point average at the national finals site. • The biological sciences major was also a Lone Star Conference All-Academic selection. • The “A” position in the Lion offense must display versatility as both a traditional tight end and a receiver. • The 6-foot-3, 255-pound Vincent Hobbs did just that in 2017, earning multiple honors and making many highlights in the National Championship campaign. • He has been selected as a first-team preseason All-American by Lindy’s and noted as a potential professional football candidate. • He was a Don Hansen’s Football Gazette second team All-American and first team all-region selection, as well as an all-Lone Star Conference first team selection. • With the ball in his hands, Hobbs was nearly untackleable by single players, and his touchdown catch against Harding was featured on multiple ESPN programs. • He had 64 receptions for 785 yards and seven touchdowns in 2017. • Hobbs ranked third in the LSC in receptions, sixth in receiving yardage, and eighth in touchdown receptions. • He caught both touchdown passes in the 20-6 victory over Winona State in the regional quarterfinals. • He also had touchdown catches in playoff wins against Central Washington and Harding and had five catches for 71 yards in the National Championship win over West Florida. • Lion starting safety Chris Smith is one of two returning players who has played in all 39 games in the last three seasons. • In the National Championship season, Smith made 44 tackles and was key in the defensive backfield. • Smith may have saved the Lions’ playoff hopes in the very first game of the season, making the tackle for a safety in the Lions’ 8-7 win over North Alabama, earning Lone Star Conference Defensive Player of the Week honors for his play in that game. • For his career, Smith has made 97 tackles with six tackles for loss, five interceptions, and 10 passes defended. • Smith was a second-team All-Lone Star Conference selection. • Smith has been announced as one of 169 nominees for the 2018 Allstate AFCA Good Works Team®, one of the most prestigious off-the-field honors in college football. • Smith is one of 99 scholar-athletes from the Combined Divisions (FCS, Division II, Division III and NAIA) vying for 11 spots on the Good Works Team. • During the 2017-18 academic year, Smith participated in numerous charitable activities and was a member of several student organizations at Texas A&M-Commerce dedicated to community service and enrichment. • He was the chair of the 2017-18 Athletes in Action organization and was a member of the Football Leadership Council. Smith has also been a representative on the Student-Athlete Advisory Council (SAAC) in all three of his years at A&M-Commerce, an organization which annually ranks near the top of Division II in community service and engagement. Smith participated in several events benefitting the Make-A-Wish Foundation, participated in numerous “Education Days” on campus, where student-athletes host elementary students at events, and was a participant at all Lion kid’s football camps and participated in events such as Clothe-A-Child, AIA Prayer Tent and the Adopt-a-Highway cleanup. • As a member of the football team, Smith joined his teammates in helping clean Port Aransas after the devastating effects of Hurricane Harvey and was a part of the team’s fundraiser to honor the memory of MSU football player Robert Grays. • Lion redshirt sophomore safety Alex Shillow will return as a backbone of the Lion defensive backfield. • Shillow (pronounced shy-low) was tied for the team lead and tied for second in the Lone Star Conference with three interceptions in his first season, playing in every game. • He also made 68 tackles, including 42 solo stops. He had nine pass breakups, a forced fumble, a fumble recovery, and 1.5 tackles for loss. • His season-high of 10 tackles came at Midwestern State. • Shillow is also the president of the Lions’ Student-Athlete Advisory Committee, which recorded 3,989 hours of community service and engagement in the 2017-18 academic year, as well as multiple fundraisers for the Make-A-Wish Foundation, which is NCAA Division II’s philanthropic organization. • In January, Shillow was selected by the Lone Star Conference to represent the LSC on the Division II National SAAC. • This is a three-year appointment to the National SAAC. Shillow attended meetings at the NCAA offices in Indianapolis last week. • Shillow is the second consecutive Lion student-athlete to represent A&M-Commerce and the Lone Star Conference on the National SAAC. • Former volleyball student-athlete Taryn Driver was the LSC representative on the National SAAC for the previous three years. • While the 2017 Lion offense gained notoriety for its efficiency through the air, the rushing game was vital in the Lions’ success. • The Lions relied primarily on a pair of freshmen in Carandal Hale and E.J. Thompson, who combined for 267 carries and a 4.9 yards per carry average in their first seasons in the blue and gold. • A&M-Commerce had six games of 15 in which they rushed for over 100 yards as a team. They also had more than 200 yards passing in each of those games (William Jewell, Angelo State, UT Permian Basin, Winona State, Minnesota State, West Florida). • Hale had 170 carries for 819 yards (4.8 per carrying average) with five touchdowns. He went over 100 yards against Angelo State and Winona State with a career-high of 106 yards at Winona State. • In his rookie season, Hale went over 1,000 all-purpose yards for the season at 1,188 yards. • Thompson carried the ball 97 times for 488 yards (5.0 per carrying average) and four touchdowns. •He had a career-high 110 yards and a touchdown in the National Championship Game win over West Florida. • He also made 11 catches for 86 yards in his rookie season. • Ovie Urevbu is also expected to challenge for playing time after missing the 2017 season. • A pair of legendary fan favorites at inside receiver have departed in the form of Buck Wilson and Shawn Hooks, but a pair of premier outside receivers will return as weapons for a new Lion quarterback. • Both Marquis Wimberly and Darrion Landry return after combining for 16 touchdowns in their first seasons as Lions. • Wimberly was second on the team and fifth in the LSC in receiving yardage and ranked third in the LSC in total receptions. • He had 64 catches for 794 yards and six touchdowns, with four games over 100 yards receiving. He had a season-best nine receptions for 120 yards in the regional semifinal win at Central Washington. • He scored the game-clinching touchdown on a dive for the pylon at Minnesota State in the regional finals, which was publicized in media outlets nationwide. • He also caught a key touchdown pass in the National Championship game win over West Florida. • Landry was second on the team and fifth in the LSC in touchdown receptions with nine scoring plays. • He had 42 receptions for 648 yards, making him the team’s top long play threat with a team-best 15.4 yards per catch average. • He earned second-team all-LSC honors and had three games with over 100 yards receiving. • His season-best came at West Texas A&M, where he had six catches for 123 yards and a touchdown. • He had two touchdown receptions against Eastern New Mexico and Angelo State. • A trio of defensive linemen who earned honors in 2017 will return to the lineup to wreak havoc on opponents. • Michael Onuoha (pronounced uh-no-ha) was named an honorable mention All-American and second team all-region pick by Don Hansen’s Football Gazette. He was also a first team all-Lone Star Conference pick. • “Big Mike” ranked seventh in the LSC with 12 tackles for loss and recorded 56 tackles on the season. • He made a season high of seven tackles at Midwestern State and had tackles for loss in 10 games, including at least one in each playoff game. • DD Fletcher was a second team all-Lone Star Conference selection as a redshirt sophomore in 2017 at defensive tackle. • Playing in all 15 games, he recorded 25 tackles and was considered as a threat on the interior of the line in the opinion of the league’s coaches. • He made three tackles each aganst Eastern New Mexico, Tarleton State, and Central Washington. • He recorded a sack and a quarterback hurry in the National Championship Game against West Florida. • Peyton Searcy was an all-LSC honorable mention at defensive tackle, making 43 tackles in his junior season. • He made 10 tackles for loss over the course of the season with four sacks. • He had nine tackles against Eastern New Mexico and eight tackles in the National Semifinal game against Harding. • He had solo sacks in each of the last two playoff games. • In the immediate aftermath of the NFL Draft, four Lions from the National Championship team earned tryouts with NFL teams, with two currently on camp rosters. • All-American cornerback Yusef Sterling-Lowe earned a tryout with the Arizona Cardinals, and offensive guard/tackle Poet Thomas earned a tryout with the Detroit Lions. • The first Lion to sign a free agent contract was tackle Jared Machorro, who signed with the Indianapolis Colts. Machorro was named to nine All-American teams at A&M-Commerce, including First Team All-American honors in the 2017 National Championship season from the American Football Coaches’ Association, Division II Conference Commissioners Association, D2Football.com, and Don Hansen’s Football Gazette, and Second Team All-American honors from the Associated Press. He was also the Lone Star Conference Offensive Lineman of the Year. • Also signing a free agent contract was quarterback Luis Perez, who signed with the Los Angeles Rams. • Perez was the winner of the 2017 Harlon Hill Trophy, awarded the top Division II college football player in the nation. He completed 421-of-596 passes for 5,001 yards, 46 touchdowns, and 11 interceptions. The 5,001 yards are the fourth-most by a quarterback in a single Division II season. He also set Division II Championship records for pass completions (144), pass attempts (211) and passing yards (1,570). He tied a Lone Star Conference record for the most 200-yard passing games in a season with 14. He became the first Harlon Hill Trophy winner to also win a Division II National Championship since 2002 and only the sixth overall in the 32-year history of Division II’s premier football award. • For his career, Perez completed 665-of-985 passes for 8,327 yards, 78 touchdowns, and 16 interceptions. He was the starting quarterback for 28 games, leading the Lions to a 25-3 record, two NCAA Division II playoff appearances, and a Lone Star Conference championship. • He was named a First Team All-American by D2Football.com, the Division II Conference Commissioners Association, the Associated Press, and Don Hansen’s Football Gazette, and a Second Team All-American by the American Football Coaches Association. He was also named the Ron Lenz Offensive Player of the Year by the D2CCA, D2Football.com Offensive Player of the Year, and Don Hansen’s Football Gazette Offensive Player of the Year. • He became the first A&M-Commerce student-athlete to win Lone Star Conference Male Athlete of the Year,won the J.W. Rollins Award as the Lone Star Conference’s Offensive Player of the Year and is a two-time First Team All-Lone Star Conference selection at quarterback. • The Lions and Javelinas are meeting for the 65th time in a series that dates back to 1930. • The Javelinas have a 35-28-1 lead in the series. • A Lion win would be the seventh straight in the series for A&M-Commerce. • The Lions’ current six-game winning streak is their longest in the series with the Hogs. • A&M-Kingsville had the longest winning streak in the series, winning seven straight matchups from 1992-99. • Of the Lions’ current six-game streak, the 2013, 2015, and 2017 wins came in Kingsville and the 2012 and 2016 wins came in Commerce. The 2014 victory was part of the Lone Star Conference Football Festival at AT&T Stadium in Arlington. • The two teams play for the Chennault Cup, which was implemented in 1991 and recognizes the late Lt. General Claire Chennault. • Chennault was a Commerce native who was a member of the famous “Flying Tigers” fighter squadron during the 1930s and was the commander of the 14th Air Force during World War II. He spent time training and teaching at the Naval Air Station Kingsville during his distinguished military career. • The original series was between West Alabama and A&M-Commerce, but shifted to Kingsville in 1992. • The Javelinas hold a 16-9 advantage in Chennault Cup games despite the Lions holding it for the past six seasons. • This is the Lions’ third consecutive game on the ESPN family of networks. • The national semifinal win over Harding was broadcast live to the nation on ESPN3. • The National Championship Game win over West Florida was broadcast live to the nation on ESPN2. 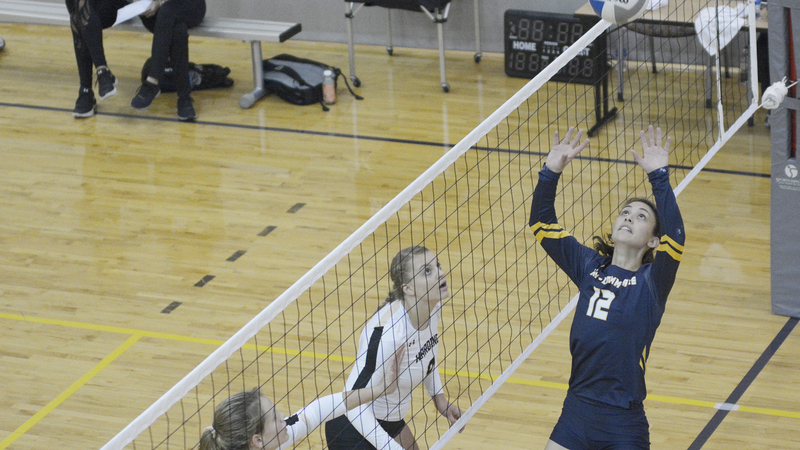 RICHARDSON– Texas A&M University-Commerce volleyball player Rylie Fuentes has been named the Lone Star Conference Setter of the Week. The award was announced by the conference office on Tuesday. Fuentes– a junior from Robinson– recorded 106 assists in the Lions’ four games last week. Working in the Lions’ two-setter system, Fuentes averaged 7.1 assists per set and helped put her hitters in good spots, contributing to the team’s .291 hitting average. She also logged 37 digs on the defensive end and had two aces. The Lions return to action on Friday as they travel to Denver to compete in the Colorado Premier Challenge. The Lions open up the Challenge against the No. 2 ranked Concordia-St. Paul, the defending national champion. The match will begin at 11 a.m. MDT. Later in the day, the Lions will face Metro State on their home floor. The Lions’ two opponents on Saturday will be determined by the results of their Friday matches.